The Aadhaar Card is one of the most essential identity proves today. It is mandatory for every individual in the country and that’s same for Chandigarh too. The Aadhaar Card is issued by the UIDAI (Unique Identification Authority of India). Previously, you have to wait in a queue to apply for the aadhaar card but now it is sorted and you can get the appointment online. If you stay in Chandigarh and are not aware of the process to apply for a new aadhaar card, the complete process is mentioned below for your help. You have to book an appointment first. Visit https://appointments.uidai.gov.in/ for that. You can find your nearest aadhaar enrolment center here. Book the appointment online or call the number of the nearest aadhaar enrolment center mentioned there for booking. You can also visit the aadhaar enrolment center yourself after checking the address from the website to apply for the aadhaar card. At the time of appointment, visit the center. You can ask for the application form from the aadhaar enrolment center when you visit there. Fill it up with appropriate information and submit it along with the Xerox copies of all required documents. Don’t forget to carry the original copies of documents as they are required for verification at the aadhaar enrolment center. After that, the official will take your fingerprint impressions and retinal scan. Then he will capture your photograph. When all done, he will submit the form and give you an acknowledgment slip. It can be used to track the status of the aadhaar card later. The aadhaar card will be sent to you via post. The maximum time taken to issue an aadhaar card is 90 days. Sometimes there is more delay due to problems in postal services. In that case, you can download your e-aadhaar letter and take a print out of it. 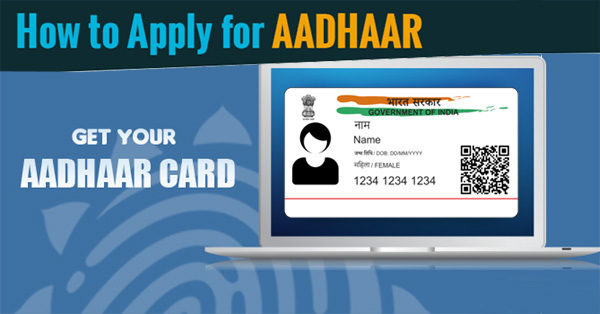 It can be downloaded by visiting https://eaadhaar.uidai.gov.in/ and entering your acknowledgment number. Proof of Identity: Voter ID card, Ration Card, Passport, PAN Card, Arms License, Driving License, etc. Proof of Address: Passport, Ration Card, Bank Statement, Arms License, Voter ID card, Insurance Document, Electricity Bill, Water Bill, etc. Birth Proof: Birth Certificate, Passport, SSC Certificate, PAN Card, Certificate issued by a gazetted officer, etc. 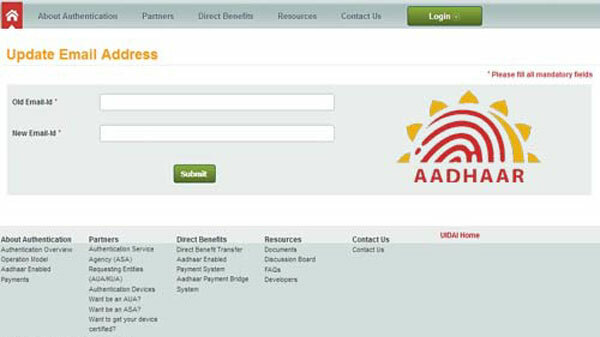 How to Update Or Correct Email ID in Aadhaar Card Online?